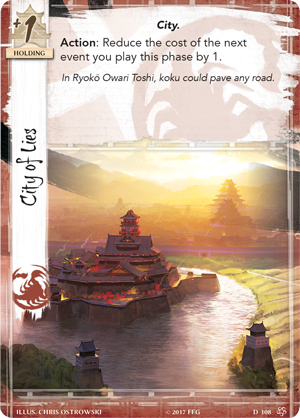 Legend of the Five Rings: The Card Game sees two Great Clans of Rokugan vying for superiority. A game begins with both players choosing their decks and randomly determining the first player. Both sides then shuffle their dynasty and conflict decks, placing the dynasty deck to the left of their play area and the conflict deck to the right. Each player then secretly selects one of their five provinces and places it facedown above their dynasty deck, and sets their chosen stronghold card on top of it. This represents your Clan's base of operations, and must be protected at all costs. Should your enemies successfully break the province where your stronghold resides, the game is lost. Players then place their other four provinces facedown between their dynasty and conflict decks in any order, creating the basis for the rest of their play area. 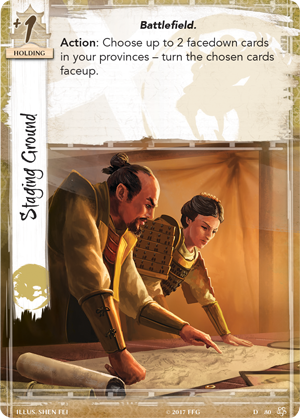 Then, a card from the dynasty deck is placed face down on each non-stronghold province. These cards will represent the impressive characters and valuable resources that will be essential to your clan's victory. Next, four conflict cards are drawn from the conflict deck. These cards represent your clan's tactics, equipment, and schemes that will give them the edge in conflict. After starting hands are drawn, players gain an amount of honor tokens equal to their stronghold’s starting honor value. While clans like the Lion will begin the game with a large amount of honor, those that put duty first will start with less. 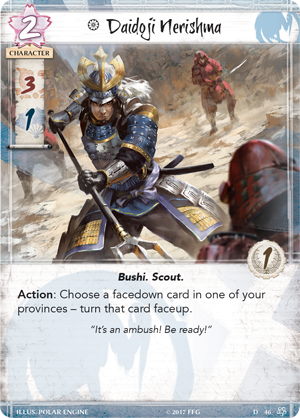 Strongholds give you vital information like the amount of honor a player starts with, how much fate they receive each turn, any strength bonus added to the province it is attached to, and how much influence can be included in its associated conflict deck. 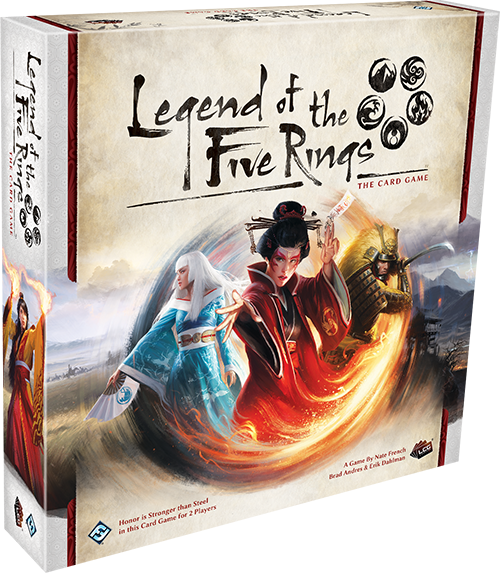 A game of Legend of the Five Rings: The Card Game is played over a series of rounds, with each round consisting of five phases. Today, we're looking at the first two phases: the dynasty phase and the draw phase. 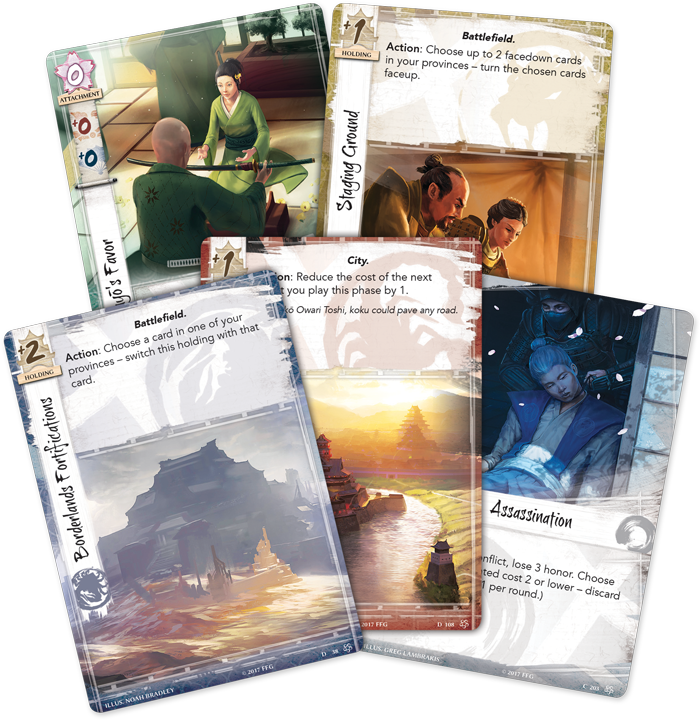 The dynasty phase begins with both players turning over all facedown cards in their provinces, revealing the holdings and characters ready to join their cause. 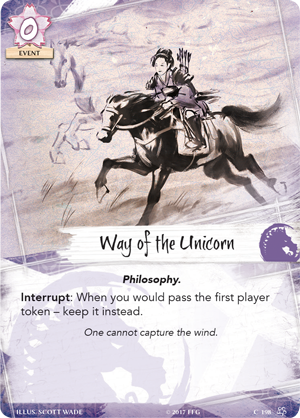 Then, each player collects an amount of fate tokens equal to the fate value found on their stronghold card—this will be the currency used to not only field your forces, but to determine how long they will serve your clan. Players then alternate doing one of the following: play a character card from one of their provinces, trigger an appropriate card ability, or pass. The first player to pass gains one fate, but forfeits the opportunity to play characters from provinces or trigger actions for the remainder of the dynasty phase. The remaining player can continue with these actions until they also pass. Deciding when to pass will be a difficult decision during the dynasty phase, as you want to be able to muster all the forces you can for the conflicts to come, but that additional fate can be a valuable resource in the coming phases when undercutting your opponent at a critical moment might be the key to victory. In order to play a character from a province, a player must pay its cost by moving that number of fate from their personal pool to the general pool, that character is then moved from its province to that player's home area. After a character is played, its controller has the option of placing any number of fate tokens from their pool on that character, ensuring that they will be among the most influential personalities in their clan for a longer period of time. A character with no fate on them must leave the conflict to attend to other obligations, while a character with several fate has a greater role to play, bringing glory to their clan through their efforts over the course of several conflicts. 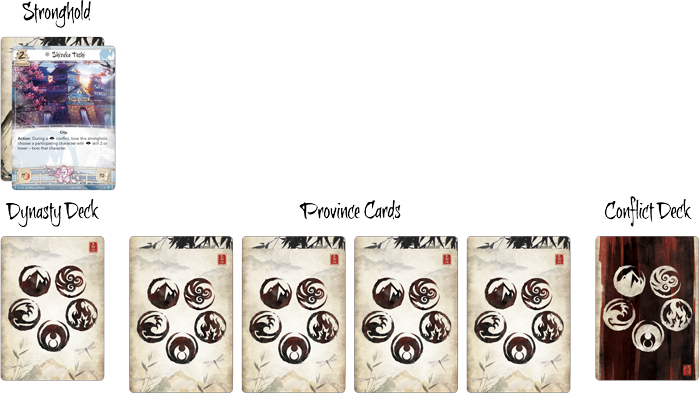 Once the option to place fate tokens on a character has been passed, the province from which the character was played is refilled by taking a card from the dynasty deck and, without looking at the card, placing it face down on the province, to be revealed during the next dynasty phase. This creates a cyclical nature to the game; as characters on the field lose fate and get discarded, new warriors are revealed to take their place. In the world of Rokugan, those who become masters at their craft help shape the destiny of their clans. These named characters provide powerful effects, and are designated as unique by the symbol to the left of their name. A player may only have one copy of a unique character in their home area. However, if a player has a second copy in one of their provinces or in their hand, they may discard that copy to add one fate to the unique copy in play. Because of Isawa Masahiro's unique symbol, only one copy of him may be in a player's home area at any given time. If a second copy is face up in that player's province, it may be discarded to add an additional fate to the Isawa Masahiro in play during the dynasty phase. 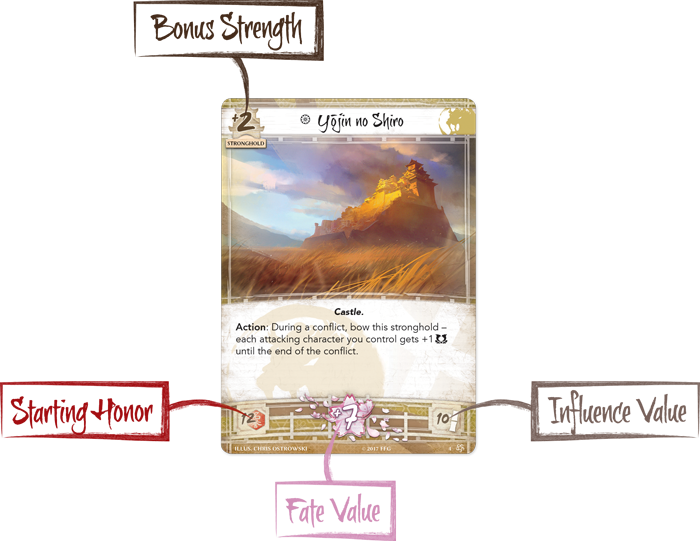 In addition to character cards, holdings can also be placed on province cards from the dynasty deck, representing lands, structures, fortifications, and other locations. These cards are not played to the home area and instead provide powerful abilities and bonus strength to their relevant provinces. While holdings can provide boosts, it is important to note that the more holdings you include in a deck, the less characters will be placed on provinces, limiting your options during the dynasty phase. 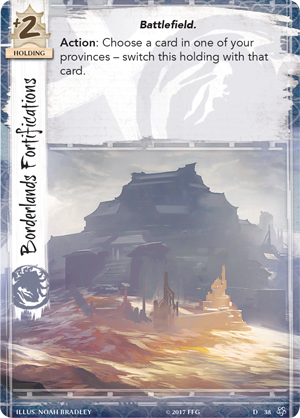 However, certain clans do specialize in defending these holdings—the mighty Crab don't just strengthen their provinces with holdings like Borderlands Fortifications ( Core Set, 36), but gain bonuses from just having them in play from cards like Shrewd Yasuki (Core Set, 29). Once the dynasty phase is completed, players proceed to the draw phase. This phase represents the plotting of the clans as they prepare for the conflicts ahead. 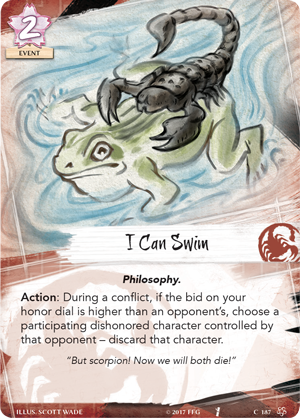 Players will bid honor, using their honor dial, in order to draw cards from their conflict deck. If you are ever reduced to zero honor, you lose the game. Conversely, if you ever claim twenty-five honor, you win the game. It is also important to remember that there is no limit to the number of conflict cards you can have in your hand, and the more you bid, the more options you will have when conflicts occur. 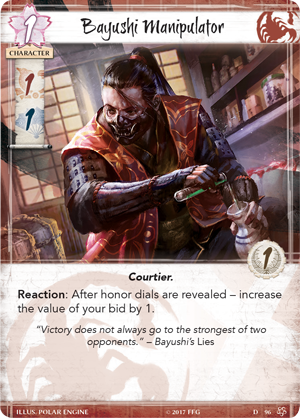 None know the advantages of this more than the Scorpion, who can not only adjust their honor bid after dials are revealed with cards like Bayushi Manipulator (Core Set, 96), but can even use powerful cards based on their dishonorable bids, like I Can Swim ( Core Set, 187). With the dynasty and draw phases complete, players are now prepared to enter conflicts, where they will use these cards and characters to vie for superiority. 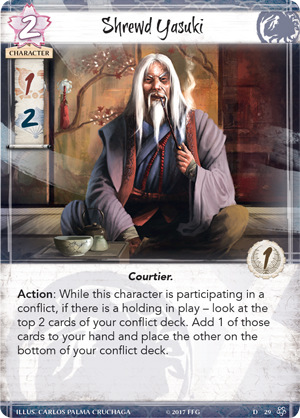 Join us next week when we look at the conflict, fate, and regroup phases of a round of Legend of the Five Rings: The Card Game. 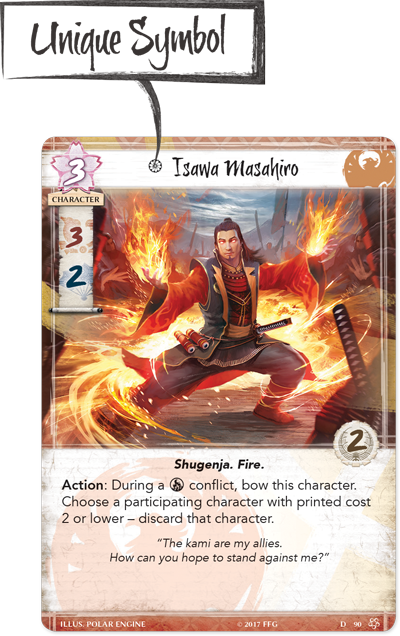 Choose your clan and prepare for the Legend of the Five Rings: The Card Game (L5C01) available for pre-release at Gen Con and world-wide release in the fourth quarter of 2017.